While the directors, Naomi and Zak, are respectively from Liberia and Senegal, Diamano Coura embodies an entourage of carefully trained male and female senior company dancers, actors, singers, acrobats, musicians, stiltwalkers, and visual artists from Mali, Senegal, Guinea, the Ivory Coast, Liberia, Gambia and the United States. Diamano Coura also embodies a junior company of 15 members and does outreach to over 500 youths between the ages five and seventeen within the San Francisco Bay Area. The Junior Company is a part of Diamano Coura's Youth and Arts-In-Education Program. Exemplifying the importance of the arts in education Diamano Coura's Junior and Senior Company have performed and made a strong impact on youths in the Los Angeles School District Young Audience Project, San Diego School District Artist-In-Residence Project, as well as countless young people in theSan Francisco Bay Area school districts. In 1990-91, touring the Netherlands and Belgium. In 1993 Director Zak Diouf and Artistic Director Naomi Washington were invited to work with the San Francisco Ballet's Val Carniporili in creating "Lambarena", a collaboration of West African dance and European style ballet to the music of Johan Bach and traditional music of Gabon. This work premiered in San Francisco in 1993; New York, NY in 1994; Salt Lake City, UT in 1995; Seattle, WA in 1996; West Palm Beach, FL and Singapore in 1998. With the success of this creative collaborative project, Naomi and Zak, on behalf of Diamano Coura, were invited to consult and choreograph for the Singapore Ballet in 1998 and in South Africa in 1999. Also a part of Diamano Coura's community outreach and Creative Partnership Program, the company was invited to partake in the making of the independent film, Follow Me Home, which was well received by other artists, film critics and audiences. 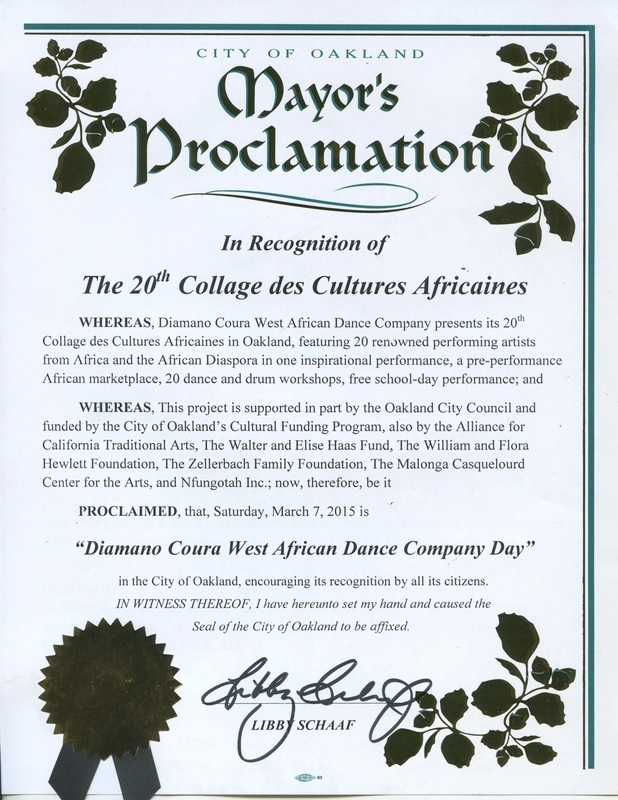 In its performance repertoire, Diamano Coura has regularly presented in works at the Epcot Disney World in Florida, the Black Dance Experience, the Ethnic Dance Festival in Sand Francisco, the Bay Area Dance Series, the Houston Arts Festival, the Atlanta Black Dance Festival, the Olympic Cultural Festival and Collage de la Cutures Africaines in Oakland. Collage de la Cutures Africaines is a collaborative effort conceived and hosted by Diamano Coura which brings together renowned artists, performing companies, and businesses from throughout San Francisco Bay Area and around the world to celebrate music, dance, history, artwork, and cultures from countries of the African Diaspora.